Upgrading to a modern garage door opener will save the hassle of jumping in and out of the car to open and close the door. The latest version include features such as WiFi smart remotes, powerful motors and additional safety. The best garage door opener is the Chamberlain WD962KEV that has an impressive features list that include smartphone control, ultra quiet belt drive, battery backup, timer to close and so much more. Installing garage door openers requires basic DIY and tools with installation taking 3 to 4 hours. Alternatively, there are professional installers that will do it for you on a labor only basis so that you can safe money on the unit online. Chamberlain are the best garage opener brand that also manufacturer the Liftmaster and Craftsman, which means build quality and spare parts are easily bought. They have built a strong following over the years and dominate the market. Quietness is a factor that many consider to be paramount so that they do not irritate others in the houses or even neighbors. Belt driven garage door openers are normally the quietest and come with a range of horsepower. Nowadays, smart garage door openers that connect to your phone via WiFi and provide useful information and custom settings are desirable. Below is a list of the best garage door openers that are capable of lifting a range of doors. The Chamberlain WD962KEV is belt driven producing 3/4 horsepower with a homelink compatibility and smart features over WiFi (MyQ Enabled). Included is a lifetimes warranty on the motor and belt, 5 years for parts and 1 year for accessories. It has a built-in battery for use as a backup in case of no power and includes MyQ Smartphone Control Technology. The technology allows complete control wherever you may be using the Home Control App for both Apple and Android devices. The steel reinforced belt uses Chamberlain’s vibration isolation system to reduce vibrations and noises, which is common with most cheap garage door openers. You can even set a timer to close the garage door automatically in case you forget. Overall, the Chamberlain WD962KEV is the best garage door opener you can buy with a range of other safety and interesting features not mentioned above. There are many positives and using the quick install rail system, it can be setup very easily. 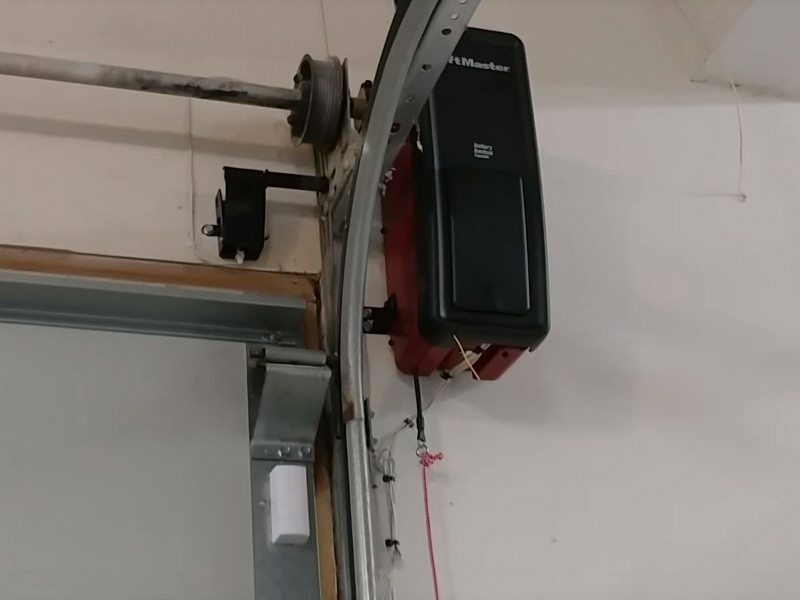 The side mounted garage door opener by Liftmaster uses a 24 DC motor to power the Jackshaft and be as quiet as possible. It is a wall mounted garage door opener that makes installation easier because there is no rails to hang but you must have front mount torsion springs for compatibility. It has MyQ Controls to electronically program security codes and a range of safety features from sensor to prevent the door going down if anything is in the way. It also has motion activated lighting and timers to automatically close. 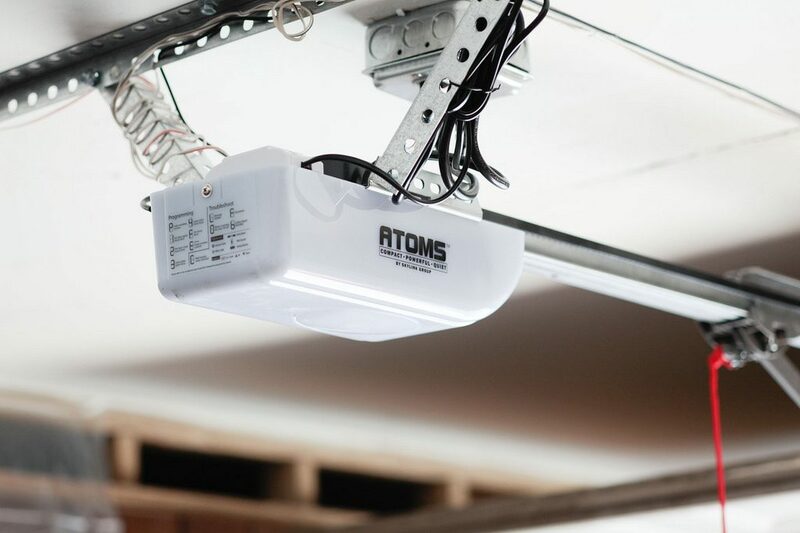 It is a residential jackshaft garage door opener that ticks every box in terms of safety and security, performance and connectivity. You can even program the computer to send emails and text alerts with updates upon the status of the opener. Overall, the 8500 LiftMaster is the best jackshaft garage door opener you can buy with all the features of the the railed alternatives. Chamberlain offer a range of models with the WD962KEV being the premium but at a much higher price. The cheaper WD1000WF offers 1.25 horsepower and a quiet belt driven system that makes it the quietest garage door opener available. It is compatible with 7708CB for 8 ft high doors and 7710CB for 10 ft high doors and has LCD wall controls to view the time, temperature, diagnostics, program additional remotes and turn opener lights on and off. Compared against the newer WD962KEV, it lacks a few features but it is still very similar in terms of build quality and operation. The WD1000WF works great for heavy garage doors and it is the quietest garage door opener you can buy with its whisper drive belt system. For those wanting a Chamberlain garage door opener but can’t stretch their budget to the ones mentioned above, the PD510 is the best cheap Chamberlain garage door opener. It doesn’t have the impressive features as the others but does have the reputable build quality and operation. It has a 1/2 horsepower motor from the chain driven operation that is renowned for being reliable with industrial strength. For peace of mind upon your investment, it comes with a 6 year warranty on the motor and 1 year on the chain and other pats. It is HomeLink compatible in order to use the wireless control system and can be installed very easily by yourself or a professional. It is the best cheap garage door opener to buy, which is a fraction of the price of the premium Chamberlain models. The Genie PowerLift is a cheap garage door opener kit with an impressive 15 year motor warranty using the reliable screw driven system to open and close garage doors. For cars less than 8 foot high, it works perfectly and comes with remotes so that you do not have to exit the car. The motor provide 1/2 horsepower, which is capable of opening and closing heavy duty garage doors up to 500 LBS. Included are 2 pre-programmed remotes with 3 buttons for simple operation of the Genie garage door opener. The benefits of a screw driven system is that is pretty much maintenance free and low profile but it is slightly louder than belt driven alternatives. Overall, it is a cheap garage door opener that is easy to program, safe and excellent value for money. An opener for your garage door provides you with easy in and out access without getting out of your car. 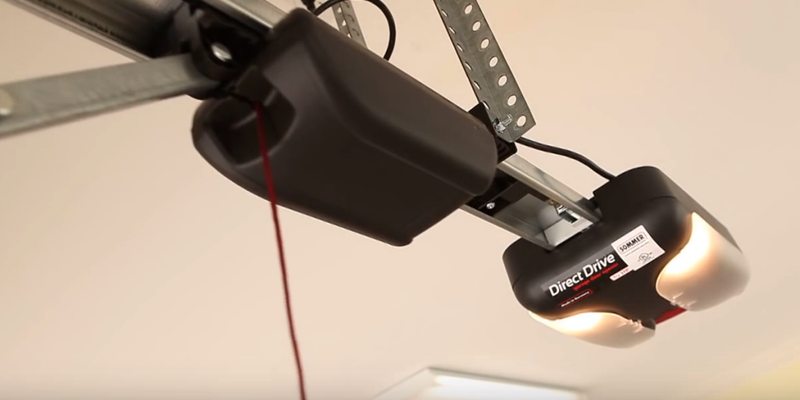 Alongside LED Garage Lights, upgrading to a modern garage door opener is one of the best improvements you can carry out to your garage. Although the end goal is the same, there are many variations of garage door openers. The factors to consider below should increase your knowledge and secure your buying decision without any doubts. Residential garage door openers are often the standard trolley bar but the later Jackshaft is preferred by a small minority. Although it was designed primarily for commercial use, the Jackshaft can be used in residential garages too and it simply mounts on the side of the door. A Jackshaft can be used on garage doors up to 14 feet tall with a maximum size of 180 feet. This means you are able to use all the ceiling space as opposed to a trolley bar, which would limit your ceiling space to the height of the garage door. This type of opener also offers excellent security as you are able to have an automatic deadlock. Keeping on the topic of security, you will not be able to pull the manual release with a long hook because it is not hanging from the ceiling. 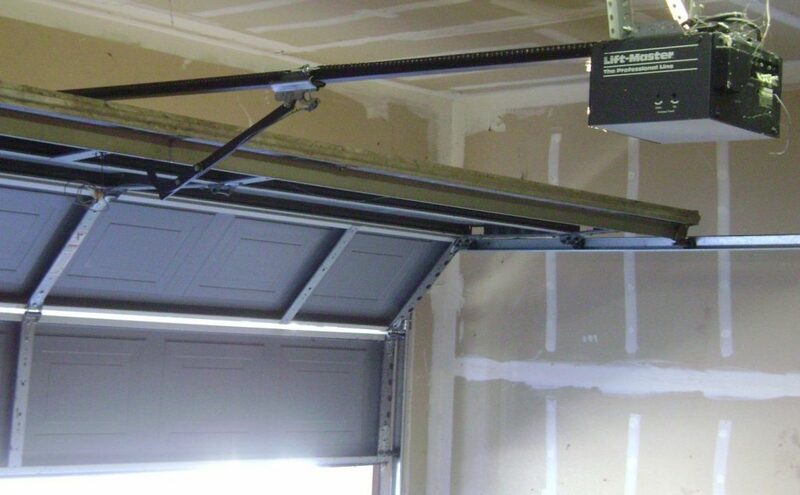 If you have installed a garage car lift inside your garage, it would be essential to get a Jackshaft opener. If you are in the market for a Jackshaft garage opener, the Liftmaster 8500 model is the best buy with a whole range of features. So you are probably thinking why aren’t all garage openers Jackshafts? For starters, you can expect to pay up to 50% more for this type of opener and the installation is slightly long winded for the average DIY goer. Also, the type of door is important as a Jackshaft would not be suitable for single panel door due to the mechanism and it would require sectional doors. It is fairly equivalent in terms of performance and the trolley bar works perfectly for most residential garage because the ceiling height is limited in the first place. The operation of the openers is very similar where a motor drives the carriage along a rail. When moving, it pulls the garage open or close but they vary in the way the motor moves. Belt driven motors uses a belt to move and is used for quieter applications that require a smooth operation. They are the best choice but are usually much more expensive that the other options. Chain driven is an economical choice that uses a metal chain to drive the trolley but it has a noticeable increase in noise compared to a belt driven operation. Screw driven is a quieter than a chain driven motor and uses a threaded steel rod to drive the trolley along the rail. There are a few other motor designs but the three mentioned are the most commonly used by manufacturers due to reliability. The majority of garage door openers range from 1/2 to 1 1/2 horsepower in most residential garages. With just a small 1/2 horsepower, a door opener will be able to lift the majority of garage doors easily but if its a heavy duty door, it is probably worth going for 1 horsepower and above motors. If an opener uses a DC motor, they will use a rating known as HPS, which is short for Horsepower Similar that will assist with comparisons. The majority of garage door openers will include the standard remotes, rail segments, security light and manual releases but its worth shopping around for additional features. These include remote controls for key chains, built-in WiFi, smartphone compatibility, auto close functionality, timers, backup battery, motion sensors and much more. HomeLink is a desirable feature that many car owners look out. It is a wireless system that allows you to open or close your garage door inside your vehicle without the need of the remote control. It is available as an addition to many of the garage door openers available at an additional cost. For those wanting WiFi, you will need to use an internet gateway known as MyQ. It uses a two way communication that allows you to connect your smartphone or any internet device to your garage door opener. Once connected, you will be able to find the status of your garage door as well as define settings and much more. It is a highly desirable feature found in most premium models. Automatic Reversing should be a key feature in terms of safety. It works by using sensor that detect obstacles and when it does, it will reverse the opener to avoid any injuries. If you were to find yourself without any power in your house but need the car out of the garage. Both manual release or backup batteries are required in order to get it opening and closing again. The manual release allows you to disconnect the door opener and open the garage by hand. Whereas the built-in backup battery runs in backup mode until the power is restored and it will recharge the backup battery. Adding or upgrading your garage door opener can be a huge improvement and will ensure your garage gets far more usage. There is nothing worse than having to get out of your car to manually open your garage door in poor weather. For those that are currently have a garage door opener but is slow or noisy, there are things you can do. Firstly check that there are no debris or dirt in the mechanism and also spray some lubrication for garage doors into the torsion springs, pulleys, tracks, lock, bearing plates and hinges. This will ensure that the opening is smooth and quiet.